Ensure delivery of Able Muse newsletters: Add ablemuse@live.com to your address book. Want to add more jolly to the Holidays season? 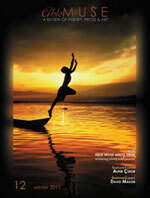 Includes the 2011 winning story & poems from contest winners and finalists. editorial: Alexander Pepple • featured artist: Alper Çukur (interviewed by Sharon Passmore) • featured poet: David Mason (interviewed by David J. Rothman) • fiction: Gilbert Allen, Rachel Bentley, Bruce Bromley, Keith J. Powell, Mary Widdifield, Douglas Campbell • essays: Michael Cohen, Seree Cohen Zohar, André Naffis-Sahely, Frank Osen, Andrew Frisardi • book reviews: Stephen Collingtonl • poetry:Suzanne J. Doyle, Midge Goldberg, Catharine Savage Brosman, Amit Majmudar, Richard Wakefield, Timothy Murphy, Philip Morre, Paul Bone, Alyce Miller, Kathryn Locey, Susan McLean, Rebecca Foust, Lyn Lifshin, Stephen Collington, George Witte, William Conelly, Lew Watts, Jean L. Kreiling, Susan McLean, John Beaton, Joshua Lavender, Catherine Chandler, Gabriel Spera, T.S. Kerrigan, Bertran de Born (translated by Maryann Corbett), Achilles Paraschos (translated by David Mason). With special thanks for an outstanding new issue to -- Juleigh Howard-Hobson (Assistant Poetry Editor), Gregory Dowling (Nonfiction Editor), Nina Schuyler (Fiction Editor), Janice D. Soderling, Tim Love & John Riley (Assistant Fiction Editors). 2011 Winners: Jean L. Kreiling - Poetry (judged by Rachel Hadas), Douglas Campbell - Fiction (judged by Alan Cheuse) . . . $500 to each winner. Complete results here. 2011 Winners: Matthew Buckley Smith for his manuscript, Dirge for an Imaginary World - (judged by Andrew Hudgins) . . . $1000 to the winner & publication by Able Muse Press. Complete results here. The Able Muse back issues - the Inaugural Print Edition, Winter 2010, and the Print Edition, Summer 2011 are still available at Able Muse Press, Amazon and other online & offline bookstore. Able Muse (print edition) reads submissions year-round. Submit now for a chance to appear in Able Muse - send your best poetry, art, fiction, essays, book reviews. The submission guidelines are available here. • International Translation Day Event: at the Translaion forum, . Hosted by Adam Elgar. Deck-the-Halls, 2011 with Distinguished Guest Judge, John Whitworth. More workshops & Distinguished Guest events at Able Muse / Eratosphere . . . stay tuned for more info! Congratulations to the 3 poets, 2 writer and 1 essayist nominated and announced here. With your helpful & generous donations here. and/or with subscriptions & purchase of books from the Able Muse Press' authors. We wish you the best of what's left of the summer, and the best of the fall season that's almost here!